As of today, 4,493 people have died from Ebola, according to the World Health Organization. Two Dallas-area nurses, who treated a now-deceased infected patient who came to Texas from Liberia in West Africa, are hospitalized with the disease. A similar number of casualties–as many as 5,000 people–died during the yellow fever epidemic in 1793 in Philadelphia, which was the capital city of the United States at the time. The number is staggering, considering that the population in Philadelphia in the 1790 U.S. Census was 28,522, making it the second largest city in the United States. What are the medical similarities and differences between Ebola today and yellow fever back then? Let’s put today’s Ebola outbreak into historical medical context. A rare hemorrhagic fever, Ebola symptoms include diarrhea, vomiting, muscle pain, severe headache, weakness, and abdominal pain. It features unexplained hemorrhage through bleeding and bruising. Symptoms of yellow fever also include hemorrhage, such as blood oozing from the eyes, nose and mouth as well as black and red vomit. Skin and the whites of the eyes become yellow, which give the fever its name. The major difference is how the diseases spread. Knowing how a disease spreads is critical for containing it, which distinguishes modern Ebola from yellow fever epidemics in the past. Ebola spreads when someone comes into contact with the bodily fluids of someone who has the disease. Hence, health care workers treating those infected are at the greatest risk and require protective gear when treating patients. Symptoms emerge between 2 to 21 days after Ebola exposure. Patients who survive develop immunity to the disease. Unlike today, the problem with yellow fever 221 years ago was that people didn’t know how it spread. Fear of coming into contact with someone who had the disease was high. Residents of Philadelphia in 1793 didn’t know that yellow fever spreads through mosquitoes, not contact with those infected or their bodily fluids. How did yellow fever become an epidemic back then? 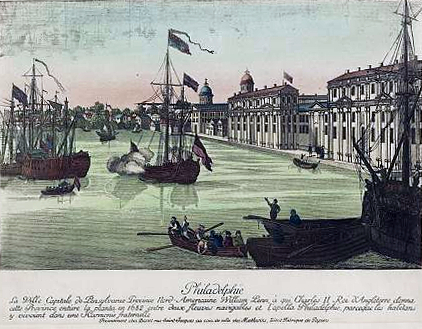 Several Caribbean Island refugees were infected with yellow fever when they arrived in Philadelphia by ship in 1793. Mosquitoes in Philadelphia bit the infected refugees and carried the disease to local residents through subsequent mosquito bites. The people of Charleston, South Carolina, experienced a similar outbreak of yellow fever in 1745. Baltimore and New Haven also later experienced outbreaks, but none compared to the 1793 epidemic in Philadelphia. Discovering that mosquitoes carried yellow fever didn’t take place until 1881. Carlos Finlay, a Cuban doctor, made the discovery while U.S. Army Surgeon General Walter Reed confirmed it through experiments. This led to containing the disease by reducing mosquito populations. Max Theiler developed a vaccine for yellow fever in 1937 and later won a Nobel prize for it. Yellow fever exists today in South America and Africa in populations that lack access to the vaccination.